Al Kemmere has always loved the rural lifestyle. The RhPAP Board member grew up as the son of a dairy farmer, a career he continued in his adult life in Mountain View County, just north of Olds. He may have retired from farming, but Kemmere hasn’t left the farm. He rents out the land, but you’ll still find him on the homestead. From day one, Al has embraced the rural life and the close-knit feeling one has with the people in the area. Kemmere ran the family dairy operation until the late ’90s and continued with mixed farming until 2007, when he retired from farming. A few years earlier, Al became involved in local politics, winning a seat on the Mountain View County Council and becoming Reeve (the equivalent of a Mayor) in 2004. In 2014, he was elected as president of the Rural Municipalities of Alberta (RMA)—formerly known as the Alberta Association of Municipal Districts and Counties—a position he holds to this day. Kemmere heading out on the range road next to his farm near Olds. The RMA is an advocate for rural Alberta and, in particular, rural municipalities with various levels of government. The organization makes sure the rural voice is heard. 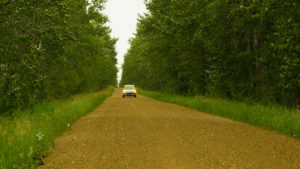 Kemmere hits the road often to visit rural communities across Alberta to hear their concerns. Now, as an RhPAP Board member, Kemmere brings with him his deep knowledge of rural communities’ concerns. It’s a win-win for both RhPAP and the RMA. Kemmere also gives RhPAP a greater voice with government. 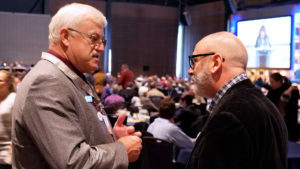 RhPAP board member, Al Kemmere chats with Bernard Anderson, RhPAP Executive Director, at an Rural Municipalities Association conference. “Whether it’s recruitment, whether it’s retention, whether it’s ambulance services, whether it’s paramedic services, whatever the services we need from a health-care portfolio, we get to take that to the minister and then report back from those meetings to our members,” he explains.